One of my favorite times of year is Halloween. I love the costumes, the food and all the fun. Not so much the scary Halloween but the fun time with family and friends and the excitement leading up to wearing your costume and having fun. That being said, I also like to make the costumes for my children reusable for the entire year. Whether they become a staple in their closet or a fun extra to add to the dress up box. My little ones wanted to be Sheriff Woody and Jessie from Toy Story. The biggest challenge for this was trying to figure out hats. My little ones are 3 years old and 9 months. To find a hat that fit and they'd keep on their heads was going to be a challenge. That is why I decided to figure out how to make a cowboy hat out of foam. Less money, less time trying to search and a great item to add to our dress up box later. I decided to make their hats out of foam in hopes that they would be a little more comfortable and less expensive. It was a little tricky to figure out in the beginning. I am no maker of cowboy hats. But since I do draft children's pattern, I figured I could make a dress up cowboy hat successfully. In the end, I figured out how to make a cowboy hat with just a bit of foam and lots of patience. I'm going to share the process I used to make these foam cowboy hats. It isn't lengthy, but I will give you a few tips to start with. To start with you are sewing foam, that means you'll have a lot of peeling of your foam on your feed dogs (those teeth) on your machine. If you have a walking foot, use it, otherwise you'll need to pull the foam a bit as you sew to help it move along. First, you'll need the measure the head. Then cut out 3 pieces. You'll need the rim, the rise and the top. The measurement around the head should be what you cut out as the center of your rim with an extra 1/2" or so. The rise should be at least the measurement of the top of the head to about the ears. I'd add just a bit more. The top can be the piece your cut out from the rim. Fold the rise in half and stitch down the side. Then place the topof the hat and the rise together and stitch around the circle. Remember your sewing foam so it won't be easy, but you can do it. Just got slow. Place your rim on your rise and pin it in place. Since it is foam, pinning is difficult, but this helps it not move as you sew. If you have wonder clips those might be a better choice. Now stitch it down. Now thread up that plastic jewelry thread and get ready to add the trim around the rim. Take a piece of ribbon to place around the hat where the rim and the top meet. Hot glue it together in the back. Not only are these great for a Halloween costume like Sheriff Woody and Jessie, but they'd be great for a dress up box or as a little gift for a cowboy or cowgirl. 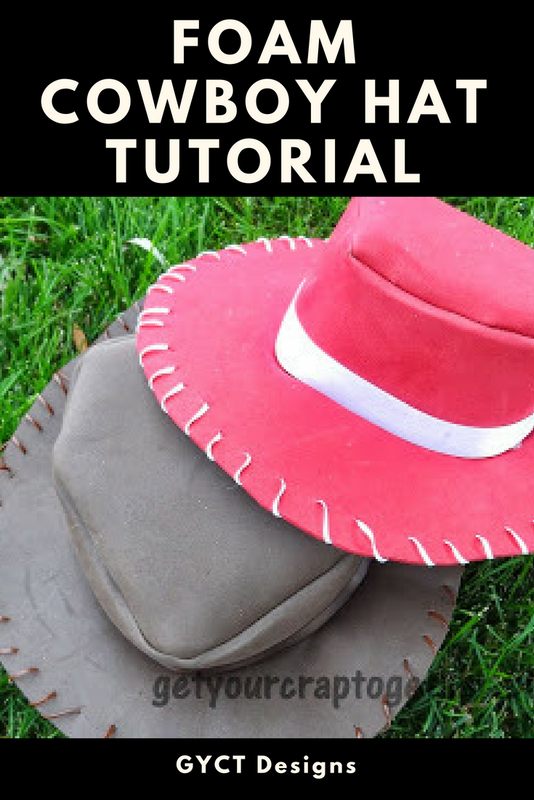 You could even teach a beginner sewist how to make a cowboy hat.